Everyone hopes for good weather when it comes to the annual family holiday, but none more so than the dediated family camper. Like all holidays, once it's booked, it's booked and you are pretty much condemned to suffer whatever is thrown at you and, usually, the worst of these will be the weather. We've just returned from our third camping trip, through Campsites.co.uk and we had spells of dreadful weather during each of them. This time, the tail end of a hurricane made us glad of our storm pegs, and this was just one of the things we learned from our previous trips. 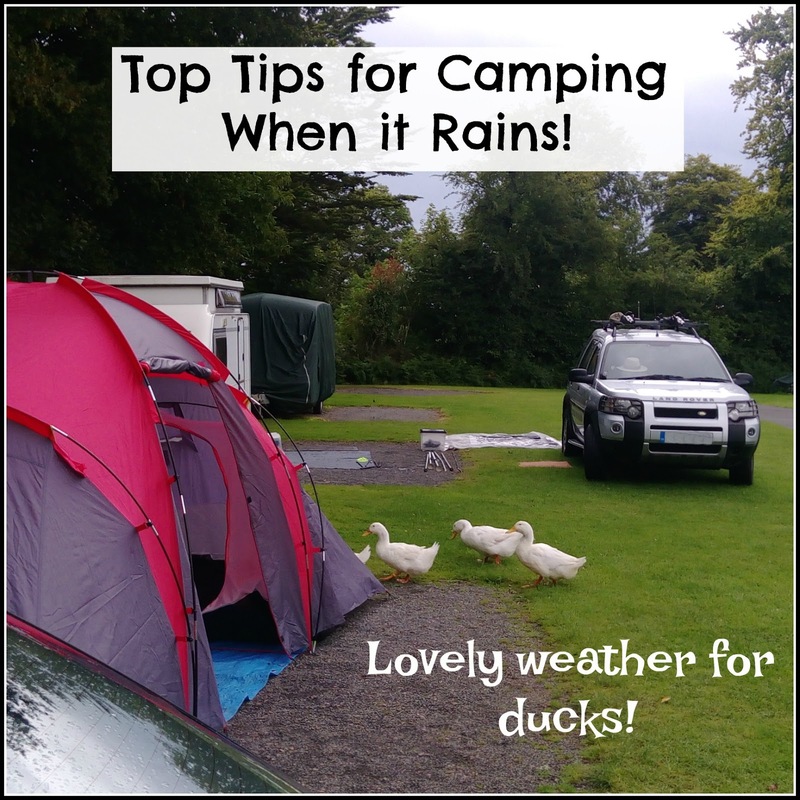 With this in mind, this post contains advice from myself and other campers on how to brave the worst of the British weather in a tent! Firstly, never underestimate the British weather. Ever. It may be beautifully still and calm when you first pitch your tent, in a sunny, dry field, but this can change in a heartbeat and you do not want to be holding your tent down in a freak storm at 3am, because you failed to get those storm pegs in when you had the chance. You can never have too many pegs and storm pegs are the best defence against the wind. I feel much more reassured when the wind is howling and I know we have those in the ground. If you have an awning, as a tent extension or for your caravan, you can also get a storm fastener strap to provide extra defence against the wind. Stephanie, from A Cornish Mum has a pertinent reason for recommending good storage for clothes: "Last time we went camping our tent sprang several leaks overnight, all in the 'living area' of the tent, which was where we were storing ALL of our clothes in a pile. My biggest piece of advice would be to always keep your clothes in something waterproof over night when camping." Emma, from Bubba Blue and Me, also highlights the point about extra tent pegs, and also suggested something I hadn't thought of, involving gaffer tape; "We'ver just got back from Wales with 2 of the 4 nights being horrendous wind and rain. Keep items away from the sides of the tent, take plastic bags to put things in (or have racks to keep things off the floor if you don't have a sewn in groundsheet), and take ear plugs. Take extra pegs and guy lines. One of my poles broke, so I'd also say it's worth taking duct tape just in case). Here's some advice from Helena of Babyfoote, leading to some wet weather entertainment, if you are brave enough! "Whatever you do, if it's raining, don't touch the sides of the tent! Unless you're feeling like you need something hilarious to brighten your evening up... in that case you draw an X above someone's head and then sit grinning while the rain begins to drip through at the point of the X. Full marks if you can get it down their neck." If you are planning a camping trip with Helena, you have been warned! 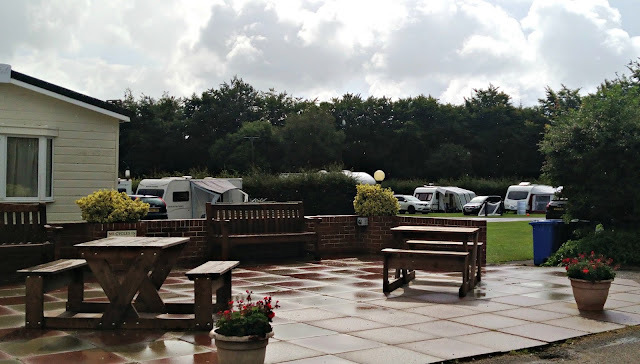 Forest Glade Holiday Park; still lovely, even in the rain! Naomi writes Tent Sniffing for Beginners and is a font of knowledge on all things camping. She has 'waded in' with some sage advice here, and I completely agree with the sock part. Every year we take more socks than the year before, and we still manage to wear them all! 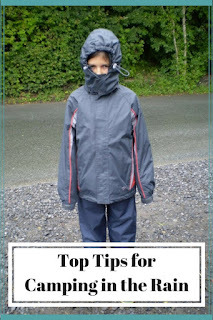 "Top tips are a good tent well pitched, lots of warm socks (warm dry feet really change your mood), and if you are worried about the tent leaking store all your clothes (and sleeping bags in the day) in black plastic bags. Have an adventure!" We kept our clothes in the car this time, just in case, but obviously that's only practical if you can park next to your tent! Obviously, your biggest challenge in wet weather is staying dry (no s**t, Sherlock!) stay with me, this is a good point. Unfortunately, without many facilities within the average tent, you really can't avoid going outside for long and wet clothes are a real pain. They make you cold and miserable, and trying to dry anything can be tricky. With this in mind, we were most grateful that I threw in these Emergency Ponchos at the last minute. I really wasn't sure if they would get used or not, but they were fab in the rain. Space is often at a premium when you are packing for a camping trip, but these take up no space, and don't cost much, so it doesn't matter if they get lost, torn, dirty or left behind. However they are utterly brilliant for staying dry when you need to run to the loo, or the shop for chocolate. This last comment is not really advice, but we had a separate 'pod' for sleeping in too, so I could totally relate to this, from Amanda at The Family Patch; "last year we camped in the awning to my in-laws caravan... Oscar and I slept in the sleeping pod area, and Tim slept in a pop up one man tent in the main awning area. One night it was super windy and the inner lining of the sleeping pod came loose and kept billowing in and out all night... I felt like I was sleeping in a giant lung, it was really quite something!" So, if you are faced with this view, as you set out for your camping trip, it is still possible to make the best of it, if you manage to maintain a positive attitude. Staying warm is the important bit, so get the cocoa on, and your warmest socks, and get out the playing cards. Remember, you're (probably, if you're reading this!) British, so you can absolutely handle whatever the weather throws at you, plus, if you are camping in the UK, our fickle weather system means you will most likely wake up to blazing sunshine in the morning! Thanks for including my tip. Once you get through your first wet camping trip you do get the 'we've beaten it' high. Our first friends camping trip we had a bad day of rain. The gazebo had flown off but other campers had caught it and tied it down. We put it right down low and sat under it out of the wind and rain. We had Dunkirk spirit...and tea. Some fab tips here! 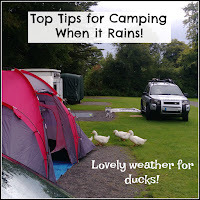 I say....a wet camping trip can be a bit of a challenge but I think there is definitely a survival aspect to it which can make you feel really good about getting through it all! 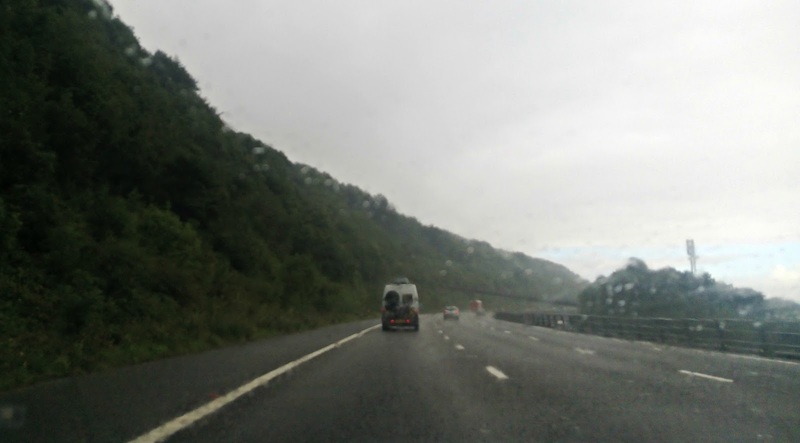 We are en route to Wales for camping as I write this! I am praying that the rain will stay away!! I'm not really a camper to be honest, but I think it would be a really fun family adventure. 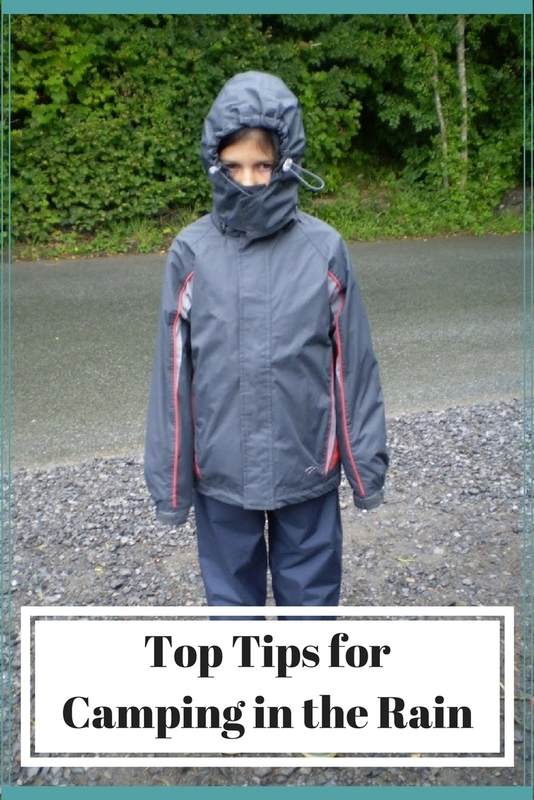 Fabulous tips... will keep them in mind and will remember to bring extra socks if we ever go camping! Yep, this is what puts me off camping!! At least in a caravan you're dry! Great tips though, will see if I do end up braving it next year. We camped in a yellow weather warning storm at Jimmys Festival in 2015 so can totally relate to these experiences. Keeping clothes dry changes everything so we put our in a black bin bag within bags. When you feel dry and warm you can conquer anything! You've got some fantastic tips here. This is what puts me off camping if I'm honest! Fantastic ideas! This is my fear with camping, would hate to be stuck camping in the rain!! I think this is great, no one ever really preps for rain when camping and most of the time it does. So this is very helpful.